Not your usual holiday cottage but a contemporary conversion of a farm building. First floor open-plan living area, brightly decorated with oak-flooring. Contemporary furniture creates a seating area around the wood-burner and TV. The dining area (seating 6) has full-height windows with views over the fields. There is a modern kitchen with a larder-fridge, electric hob, oven, microwave and dishwasher. The property has three bedrooms, all with views onto fields - two double bedrooms, one with doors to the terrace, the other with en-suite bathroom. Both bathrooms tiled as ‘wet-rooms’ with showers, hand-basin, and WC. All linen is provided, table linen and tea towels. The bedlinen is 100% cotton, ‘Devon wool’ duvets and pillows. Ecological dishwasher tablets and washing liquid is provided. There is a utility/boot room with washing machine and drying facilities. Logs and barbecue provided; electricity and heating is included in the rental. Visitors are welcome to swim in our outdoor family pool which is at the bottom of our garden, between 4pm and 6pm in the evening. (Please note it is a deep pool, not suitable for non-swimmers and children must be accompanied by an adult in the water at all times). Footpaths surround our working mixed farm, where we keep Black Welsh Mountain Sheep, Red Devon Cattle and traditional breeds of pigs and chickens. We manage the land under a Higher Level Stewardship scheme, which ensures that the orchids and other wild flowers are preserved and the birds and wildlife flourish. We have our own meat available in season and eggs most days. We can recommend award-winning restaurants and pubs that are worth a journey, great farm shops and markets for superb local produce, and the usual supermarkets. We can arrange quality catering and box delivery on request. Bike hire can be arranged from Colyton and horse riding in the valley. Tennis courts are located in Seaton & Sidmouth and there are excellent golf facilities at Honiton, Woodbury, Budleigh Salterton and Exeter. Rural retreat near the coast: We are located at the end of a narrow country lane, in gently undulating countryside. This part of rural East Devon is surprisingly near the coast; the fishing village of Beer and the un-spoilt Branscombe beach, but also not far from the Cathedral City of Exeter and Dartmoor. Great for day-trips to all the beaches of Devon including surfing to Saunton & Croyde. Ideally located for exploring the county, Dorset, Somerset and Cornwall and many historic National Trust houses and gardens are within easy reach. Feb - Snowdrop and wild daffodil drifts on the farm. April - On the farm - Mountain Biking through the Bluebells. In the valley -The Wiscombe Hill Climb season starts - Classic Cars come from all over to race - uphill! May - Bank Hol. Colyton Tractor Rally - Vintage tractors (including ours) and it’s getting competitive! June - Axe Vale Festival of Gardening & Crafts-our local ‘Chelsea’. Mackerel fishing -off Beer. Aug - Honiton Agricultural Show Largest One day Show. Making hay (times may vary!). Sept - Colyford Goose Fayre Medieval dressing-up, Elderflower champagne, Greasy pole and ‘jousting'. Carnivals catch the procession in Colyton hot lights/narrow streets also in Sidmouth & Honiton. Nov - Ottery St Mary Tar Barrels. A mad night out everyone should experience at least once. Dec - Exeter Cathedral for Carols and Christmas shopping. Both bathrooms are fully tiled wet-rooms. Available to hire from Soanes Cycles in Colyton. Visitors can swim in our outdoor family pool which is in our garden, between 4pm and 6pm in the evening. Not suitable for non-swimmers, children must be accompanied by an adult in the water. We do not allow dogs, except guide dogs by arrangement, as we are a working farm with livestock and poultry, we also have our own farm dogs. Just got back from a long weekend break. The property is very spacious with wonderful views. Lovely wet room bathrooms were a nice touch. Deborah and Anthony were very attentive hosts, as were the 2 farm dogs, who soon made friends with our 7 year old granddaughter. If you are a foodie, the joint of lamb we bought from the farm was delicious! Whilst we enjoyed the peaceful remote location, it it perfectly located for destinations such as Lyme Regis and Sidmouth which were both about 30 minutes away. Highly recommended! We have just returned from a 4 night stay at Buckhouse Farm, Deborah and Anthony were very welcoming and accommodating during our visit. It was lovely being on the farm our son loved seeing the tractors, cows, sheep and above all Bella and Jess (such lovely dogs)! Due to the weather we didn't get to use the pool. The toy box was a big hit with our 3-year-old son, we took loads of our own toys, but he didn't look at them once! The barn is very nicely decorated with wonderful views, however we do have some personal feedback following our stay. The barn is open plan and all hard-wood flooring; therefore, any sound can be heard in any room and when you have a 3-year-old and a 6-month-old trying to nap, that was quite tricky. The barn could have been a bit cosier of an evening, even though the barn is not overlooked blinds on the windows and balcony doors would have been nice. Sadly, the sofas are not very comfortable and only seat 4 people, the other two seats were chairs. The kitchen was nicely done, however there was no cupboard storage for our food, so we had to put it all on the work surface which didn't leave any room to cook our dinners. Finally, the blind in the room with the single beds that our son was sleeping in didn't close, thankfully we had taken our own blackout blind so this didn't matter, but had we not it would have been very annoying. We still had a lovely time at Buckhouse, we just feel the style of house didn’t work for us as a young family, but had our children been older or we were going with friends it would have been more suitable. We didn’t find the lanes off putting or difficult to navigate, it was nice to feel truly out in the country. Thank you. We really enjoyed our stay in this picturesque area. The accommodation is an upside down house, and lovely, with great views across the Devon countryside. We were made very welcome, and loved the dogs, who are very friendly. We didn’t use the swimming pool as the weather wasn’t warm enough, but I understand it can only be used between 4&6 in the evening, so don’t expect long days lounging by the pool. It is an ideal centre for walking and exploring the countryside. The only word of warning I would make is for anyone staying at this lovely place you must be able to negotiate about 3 miles of twisting, single track lanes, with high hedges and be prepared to reverse at speed, as the locals don’t slow down! Nice owners, nice dogs, nice views and a spacious property but sorry that's where it ends. I booked the property for six of us, my wife and I, my daughter, son-in-law and grandkids 12 & 8, both of whom are water-babies, hence my reason for selecting a property with a 'PRIVATE, HEATED SWIMMING POOL'. A few days before travelling we saw a new review that stated use of the pool was limited to between 4pm and 7pm only. My daughter contacted the owners who were nice, so we decided it was too late to cancel and we would make the most of it. What the owner forgot to tell us was the pool heating had been turned off because the water was green! They blamed the problem on the recent warm weather. However, the pool rim was filthy and with animal feces around the farm and newly tilled earth alongside it, it was, on reflection, a very dangerous activity to use the pool at all. The kids were so excited when we arrived I took them in for 15 minutes but it was filthy and very cold - last time for me. We let the kids only use it twice more during the stay so our usual couple of days sitting out by the pool at our rental summer property was not possible and we were forced to go out every day. Some would see it as a benefit, but virtually no internet and no phone signal was annoying. The children's swing in the field would have been great but the volume of sheep feces all around the base of the swing made it a single visit. The property is 2.7 miles from Colyton entirely along ultra narrow single track road just wide enough for the car with 10' hedges both sides most of the way. Nearing the property the grass is growing out of the middle of the road to give you some idea of the remoteness. Not a problem if you have a car you don't mind getting scratched. If you think it difficult reversing up on a pitch black road at night with a few inches either side of the vehicle, don't rent this property. It's a bit shorter if you drive there from Honiton, the lanes are still only just passable but beware the potholes, I now not only have a scratched car but also a problem with a front tyre. In summary, if a property owner advertises a 'PRIVATE HEATED SWIMMING POOL' it should be private, which it is not (it's next door) and it should be clean, which it was not. Dirty sides, dirty surround and green water demonstrates that the pool is not MANAGED properly. Nice people but it meant we were forced to only use the property for sleeping - not at all what we paid for! I am sorry that you have not had the holiday that it seems you were expecting. We have made our pool available to guests at Buckhouse Farm but with this year’s high temperatures, have struggled to keep the water clear, but this has not affected the safety of the pool water for swimming. We make it clear in our listing that Buckhouse Farm is a working livestock farm, in an idyllic, isolated rural location. That said, it is reasonable to expect dung in the fields as well as narrow lanes, hedge-banks and occasional potholes. Yes, unfortunately, we do have a variable broadband and mobile phone signal although many of our guests see this as an advantage! Our Visitors Book for the week of your stay shows the following, written by your daughter: Thank you both for a fabulous stay in your beautiful barn. The accommodation is fantastic and the views are breathtaking. You have been the most welcoming and hospitable hosts, which makes all the difference. We wouldn't hesitate to recommend Buckhouse Farm to friends and family. Gorgeous property, lovely pool and welcoming hosts. This is a gorgeous property, very tastefully furnished and comfortable with lovely views over the countryside. Hosts Deborah and Anthony were very welcoming, as were their lovely dogs Bella and Jess! We have had a lovely, relaxing week here. The kids have loved using the pool, although we were a little disappointed when we first discovered that it was only available between the hours of 4pm and 7pm. In the end this wasn’t a problem as it allowed us to have a day out and then return by 4pm to use the pool. It wouldn’t stop me booking again. The country lanes to the barn are very narrow but are fine if you take it slow. The lane to the barn did have a few potholes in it as mentioned on previous reviews but this was being resurfaced as we left so will no longer be an issue. Overall, this was a lovely, relaxing holiday and I would recommend Buckhouse Farm Barn to anyone wanting a laid back holiday. 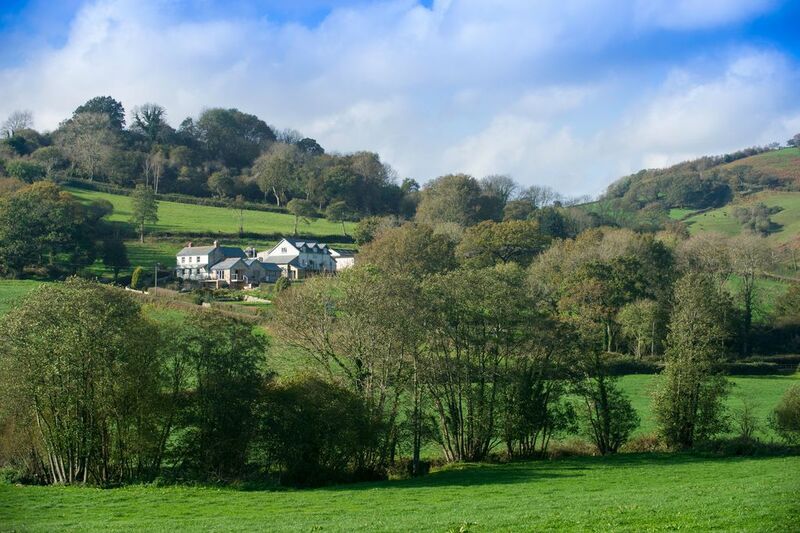 Situated in East Devon, in superb countryside not far from the famous Jurassic coast. 4 miles from the fishing village of Beer, the beach at Branscombe and the Regency resort towns of Lyme Regis and Sidmouth. Beautiful walking and bird watching country in this designated area of outstanding natural beauty. An ideal location for exploring Dartmoor and Exmoor as well as the rest of the west county. Deposit by Bacs or cheque to secure let. Balance four weeks prior to arrival. Changeover day Sat arrival 1600hrs departure 1000hrs. Only visitors only by arrangement due to location. No smoking in the building. No fireworks .